Gold is trading higher and jumped more than $20 from low of $1301.80.Gold was one the best performer in Jan and has jumped more than $50 on account of dovish Fed and global uncertainty. US dollar Index: Bearish. DXY has declined more than 60 pips from high of 97.37.The index’s major resistance is around 97.71 and any break above targets 98/98.60. (positive for gold). USD/JPY: Weak. USD/JPY has declined more than 80 pips and shown a minor recovery.It is currently trading around 110.60. The near term resistance is around 111.40 and any break above targets 112.Slightly positive for gold. US 10 year yield : US 10 year yield has formed a minor top around 2.715% and shown a decline nearly 2.5%.The yield has been trading weak for past two months and lost nearly 22% from high of 3.25%.It is currently trading around 2.66%.slightly positive for Gold. US 2 year yield: It is trading around 2.52%. The spread between US 10 year and 2 year has declined to 14bpbs from 30 basis point. The spread between 5 year and 2- year yield has inverted (US 2 year yield trading above US 5 year yield). 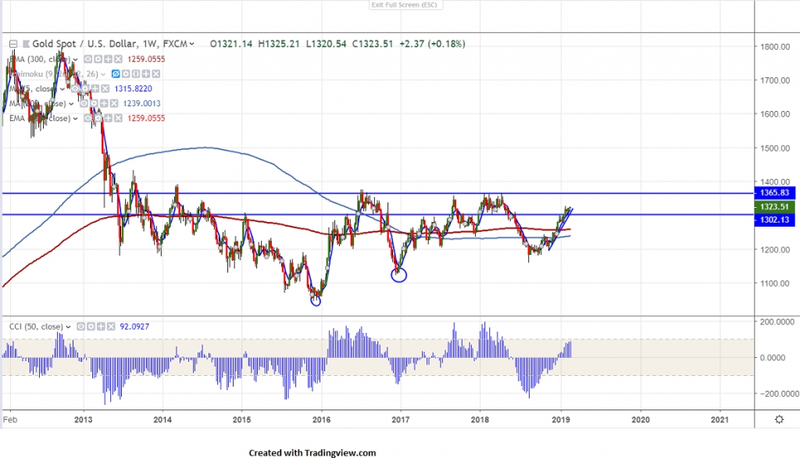 On the higher side, yellow metal is facing near term resistance around $1326 and break above will take the gold to next level till $1335.The yellow metal should break above $1335 for further bullishness. The near term support is around $1315 (3- W EMA) and any violation below will drag the commodity down till $1307 (5- W MA)/$1300.Any break below $1276 confirms minor weakness. It is good to buy on dips around $1312-13 with SL around $1305 for the TP of $1334.